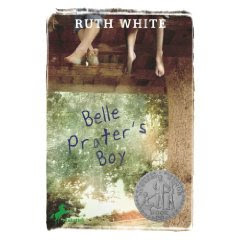 Finished another YA novel that I loved: Belle Prater's Boy ...took a little while to get into it, but so worth the effort. Also read a grown-up book: Running With Scissors: A Memoir by Augusten Burroughs. I picked it up for a superficial reason -- vague association with Tegan and Sara -- and it was sort of painful to read, but compelling enough to keep going anyway. If nothing else, an exercise in thankfulness because his childhood was so messed. Thanks to Vicki, we got fantastic tickets to see Nine Inch Nails, playing in Kelowna in December...I've been a fan forever and never seen them, so it was overdue. Sounds like cousin Richard should be flying out to join me, Andrew and Robin for the experience. Finally watched The Story of Stuff online, long ago recommended by The Log Driver -- only 20 minutes, and not exactly uplifting...but important. Finished reading The Dragon of Lonely Island with the girls -- we had read it before with good success and they loved it again. I've been listening to old Metallica again and may even pick up the new Rick Rubin-produced album. We've been going through old art books I had with collections of prints, pulling out classic paintings to discuss and use them as inspiration for drawing our own pictures. I got to play art teacher, and even did some learning myself. Wow, that is AWESOME! You guys must be SO proud of those two girlies! They are SO bright! I can't believe that Ivy is talking about the "elements" of the art piece! CRAZY! maybe once Jaia is officailly homeschooling, your girls can come and teach him! I have two magazines for Tannis, just need to find a moment this week to drop them off. If I don't make it over, just know I was crazy busy and will soon. Of course we're proud! But I suspect you could give any kids those ages that same type of activity and they'd do similar things with it. Ivy was giggling when she read what you wrote about them teaching Jaia -- pretty much her dream. There is a wonderful profile of Annie Leonard, creator of Story of Stuff, in the Sept/Oct 2008 issue of Women's Adventure Magazine. She is awesome. Check it out.